Readers of pp will know that this time last year I was staying in Silver Spring with my mother, who had had an operation. She went in for a second operation toward the end of January, four days before I was due to go back to Berlin. We had been told this would be very simple and straightforward; she was in surgery 6 hours, and after one night on the regular ward was moved to intensive care. I asked my agent again for the ARC of his memoir, which he had been promising to send; he said none were left as he had been keeping his distance from that side of things. I pressed the point, and he resigned. It has been a long bad year. I went over to New York at the end of September for a few weeks in the hope that I could talk to some editors. I'd been told there were a lot of people who liked my work; I didn't know who they were but hoped something might turn up. People were extraordinarily generous with their time. There have been some developments; as always, it takes reserves of patience and goodwill for things to work out. It seems as though I sometimes say things on the blog that provoke hurt feelings among readers. I try to explain that there are things I can't deal with at a bad time, and get e-mails from people whose feelings have been hurt because things they thought were helpful were the kind of thing I couldn't deal with. In the past, this kind of thing that has made deals fall through. It seemed best not to say anything for a while, and try to take things forward as best I could. When I was at Oxford we were dragooned into answering the question we had been asked, rather than some other question we happened to find easier to answer. When my agent resigned I could not see a way forward and thought suicide the only solution; card-carrying rationalist that I am, I thought he might see a solution I did not and that therefore the rational thing to do was ask. So I wrote an e-mail. I did get a reply, but it did not answer the question. I then got several e-mails from the reader who had introduced us, which also did not answer the question. If I had known that going to New York to talk to people would be so helpful and productive I would simply have taken a plane to New York. I have been rereading Orlando Patterson's Slavery and Social Death, a superb work of scholarship which no home should be without. A reader sent me a link to a video of a poem he wrote and performs. To mark National Poetry, Day Nick Rennison, who compiled the Waterstone's Guide to Poetry, and Michael Schmidt, editorial director of Carcanet, invited a number of contemporary poets to select work by poets of the past, beginning in the late fourteenth century and ending in the early twentieth, and to provide brief headnotes to describe their choices. The result is an anthology with a difference. 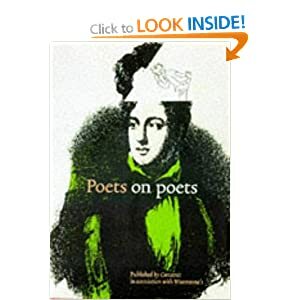 From Gower to Yeats, from the old and the new worlds, the selectors and the selected converge in a volume of wonderful poetry and rich surprise. Nick Rennison and Michael Schmidt, in association with Waterstones: Poets on Poets, Carcanet, 1997. [Sorry, should have been clear: the book is also available for purchase on Amazon.co.uk, here.